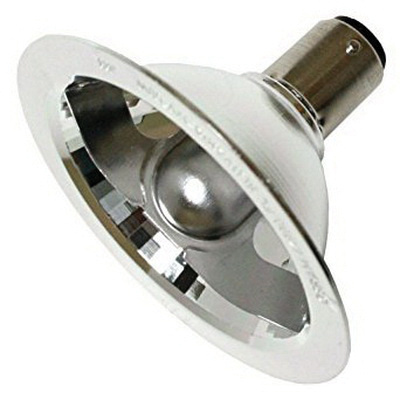 Osram Sylvania Low voltage reflector 50-Watt AR70 BA15D double contact bayonet base tungsten halogen lamp offers 400-Lumens of light output. It has voltage rating of 12-Volts. This small profile lamp has color rendering index of 100. It has color temperature rating of 3000K to radiate warm white light to the surrounding. This sealed beam shape lamp with C-8 filament, offers average life of 3000 hours. It has a dimension of 2.75-Inch x 1.97-Inch. It emits or distributes flood light at beam angle of 25-degree. It is suitable for atriums, retail, artwork and sculpture, high-end residential, commercial, downlight, track and accent fixture.